Tom and Lily Munro have been married for 16 years. They love each other and are happy in their respective, successful careers. With a cute teenage daughter and a son who has never caused them any grief, their life is just about perfect. Then Lily becomes a victim of a school shooting and is left fighting for her life. Tom's beside himself with fear. What will he do if she dies? How will he live without her? And what about the suspicious lump he's found in his breast? Does he have the courage to find out if it's serious? In the midst of his fear and panic and indecision, his daughter begins acting out. With Lily still gravely ill in hospital, Tom's at a loss what to do. He has so much more going on right now. Finding time to sit with Cassie and delve into the reasons for her behavior are almost beyond him. He wants to believe it's nothing more than normal teenage rebellion, but his heart is telling him it's so much more. His once-perfect life is falling apart shattering before his very eyes. Can he stop the carnage before it's too late? Will this Munro family ever be able to pick up the pieces? 3/5 stars. I liked the story and characters overall. Some passionate romantic scenes. The narration is excellent. Some issues with soap opera-type coincidences and melodrama. 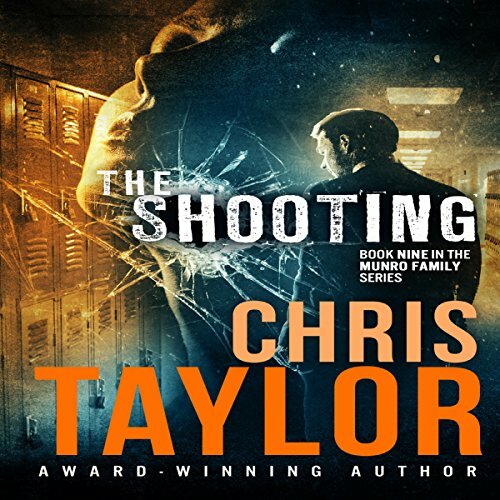 The Shooter is the 9th book in the Munro Family series by Chris Taylor. Tom and Lilly have been married for several years when the series started so we never got their story...until now. Lilly gets shot at the elementary school she teaches at and Tom finally gets the lump in his breast checked out. It's cancer. As he is going through the cancer surgery and recovery and Lilly is still in a coma, Tom reminisces about how they met and fell in love. Narration by Noah Michael Levine and Erin deWard is great.